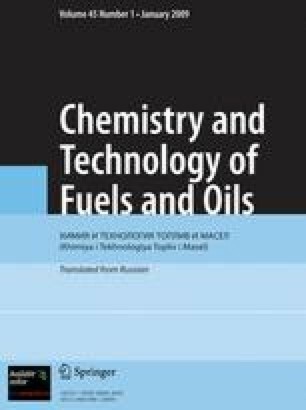 The thermal properties and structural features of industrial water-oil emulsions were investigated with microwave treatment. The critical concentrations of water at which abrupt structural changes take place were determined. The effect of the mass fraction of water in the emulsion on its heating rate and the efficiency of demulsification was studied. A 15–20 or 60–65% water content is recommended for breaking down emulsions. Demulsification takes place with minimum power consumption and with the highest efficiency. Translated from Khimiya i Tekhnologiya Topliv i Masel, No. 1, pp. 36–38, January–February, 2007.